BLU launched its new smartphone called BLU Life One X2 Mini . As the name suggests , it is the lower edition of Life One X2 smartphone launched back in September last year. The new BLU Life One X2 Mini sports 5 inch display compared with 5.2 inch screen of higher edition. The Smartphone powered by same Snapdragon 430Soc but now it offers Mini 30% increase in performance compared with previous edition and coupled with 4GB of RAM and 64GB of inbuilt storage. 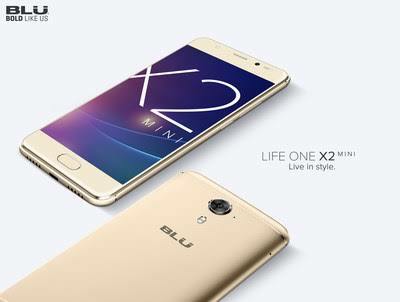 The new BLU Life One X2 Mini feature a 13Mp rear camera and a 8Mp front facing camera . The Smartphone packs with 3000mAh battery and runns on Android 6.0.1 Marshmallow. The smartphone available in Gold, Rose gold and Grey colour options. The Life One X2 Mini measures 142×69.6×8.7 mm and the Life One X2 Mini comes with price tag of $179.99 and is now available for purchase from Amazon.